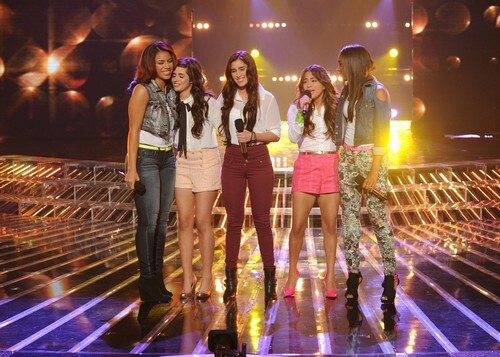 Fifth Harmony took the stage tonight on THE X FACTOR USA for their Top 6 video performance. Fifth Harmony sang “Set Fire to the Rain” by Adele for their unplugged song. Tonight’s show the top 6 performed live in front of coaches Simon Cowell, Britney Spears, Demi Lovato and AJ Reid for America’s vote and to make it another week. The Top 6 had not one, but two, songs to perform in front of our judges, Simon Cowell, Demi Lovato, Britney Spears and LA Reid. They will be taking on the song that YOU, the fans, chose for their Pepsi Challenge performance as well as an unplugged song that we can’t reveal to you until show time. Did you miss tonight’s episode? If you did we watched it and we recapped it here for you. Judges comments: LA points out the obvious, there was no harmony they all sang separately. Britney can’t figure out what makes them stand out and Demi thinks they don’t click as a group. On the Top 6 result show tomorrow tune in for an all-new episode with performances by Melanie Amaro, last year’s winner of THE X FACTOR, who returns to the stage to perform a new, never-before-heard single from her debut album, “Truly…”; and global superstar Ke$ha, who debuts her new single, “C’Mon.” Then, Khloé and Mario will announce the acts that made the cut and who will be going home.